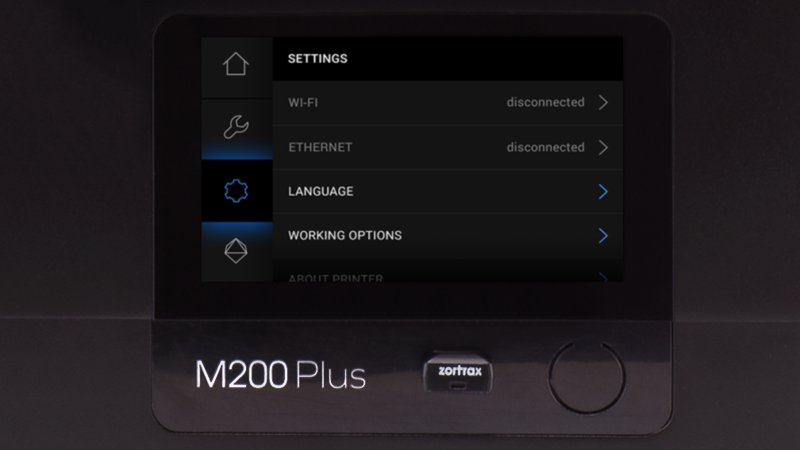 The M Series Plus printers are equipped with a Wi-Fi module and a network interface card, which allow users to connect the printer to a local network. These components support two types of connection: Wi-Fi and Ethernet. Both methods allow you to manage the printer directly from Z-SUITE and make it possible to remotely transfer .zcodex files from your computer to the printer. 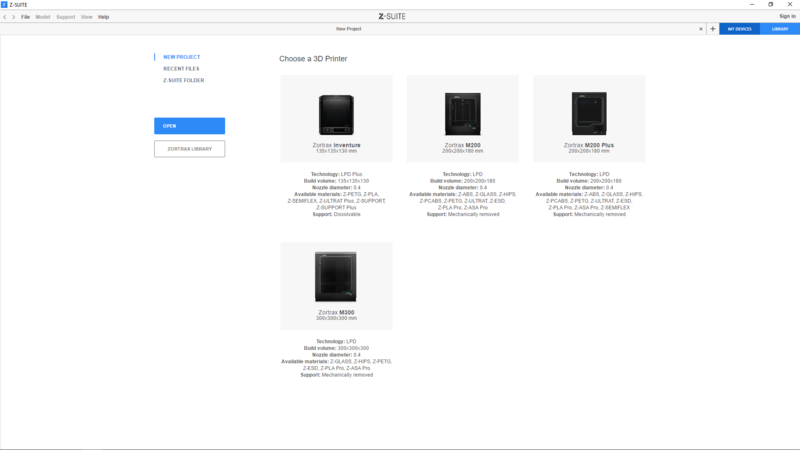 You can also start, stop, and pause the printing process in Z-SUITE and browse through the models that you saved in the printer’s storage. 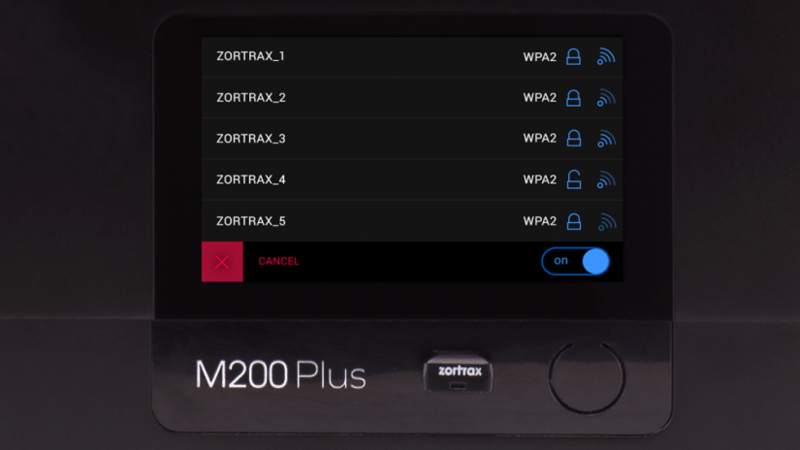 Also, if you connect your printer to the Internet (using either method), the device will automatically check for available firmware updates and make the whole process of updating easier. More details: Firmware manual. To connect the printer to a Wi-Fi network, open the Settings menu and select Wi-Fi. From the list of available networks, choose your network and if it’s required, enter the password. Select Connect to establish the connection. 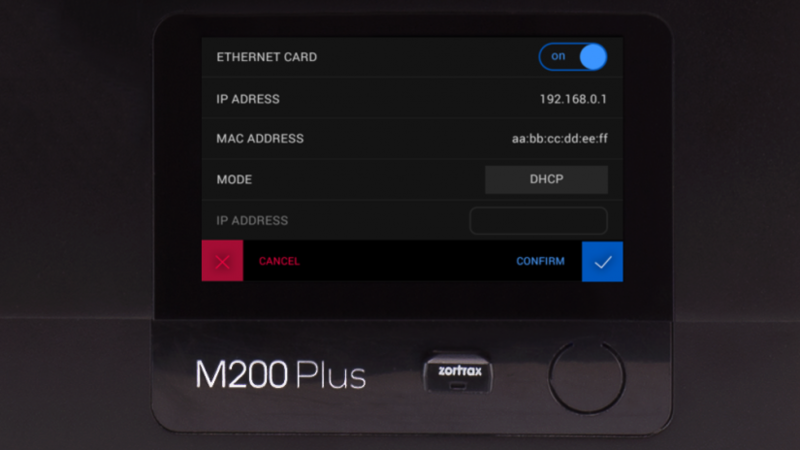 To connect the printer with an Ethernet cable, create a local network and connect the router/modem/switch to the printer. The connection will be established automatically. You can control the Ethernet connection settings in the main menu; select Settings and Ethernet. Once your printer is connected to the network, open the My Devices panel in Z-SUITE. 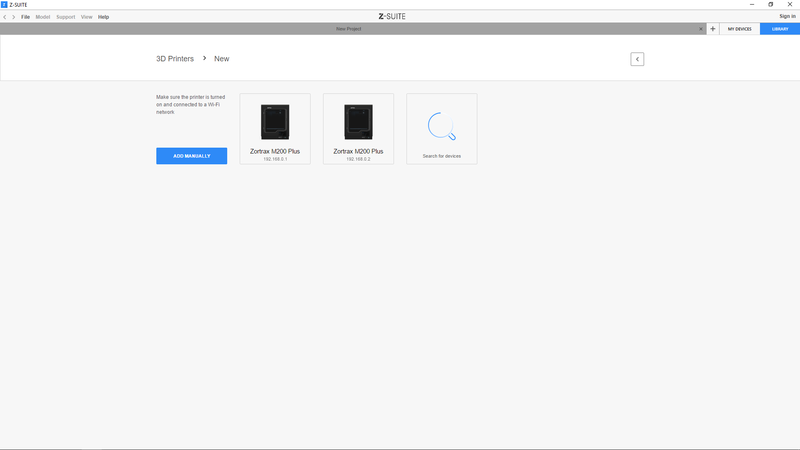 You can search for devices available in the local network and add them to the program’s panel. 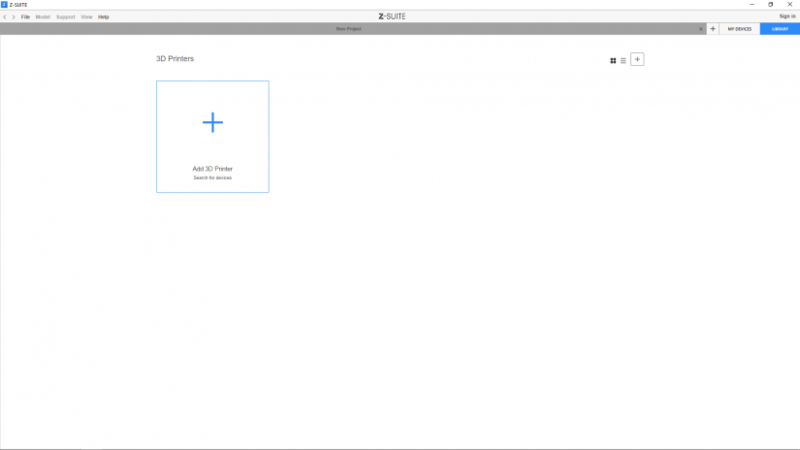 Select the icon with your printer’s IP address and click on it to add the printer to the panel. You can also add a printer manually by typing its IP address. 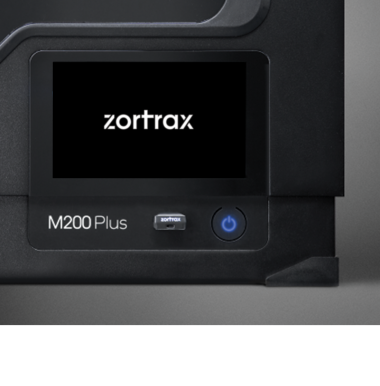 Each added printer can easily be managed in Z-SUITE. 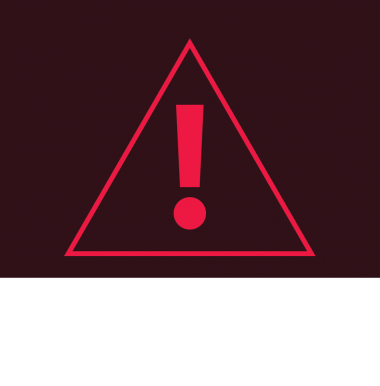 You can start, stop, and pause the printing process, see the printer’s current state (Ready to Print / Printing / Paused / Offline), change the name of your printer, preview basic information about the printer, or display the preview from the printer’s camera. 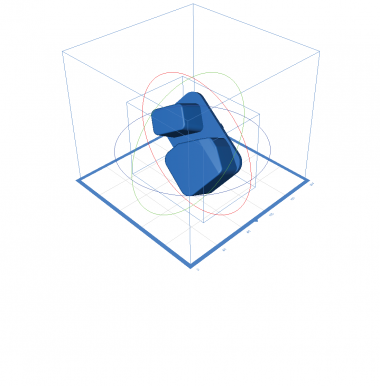 In the 3D Printer Files tab, you can preview all .zcodex files that are stored on the printer’s USB flash drive.